Discover Jamaica’s “Graceland” and visit the local jerk center for an authentic meal. Listen to reggae music on the scenic drive along Jamaica’s coastline and winding country roads to the mountain village of Nine Miles. 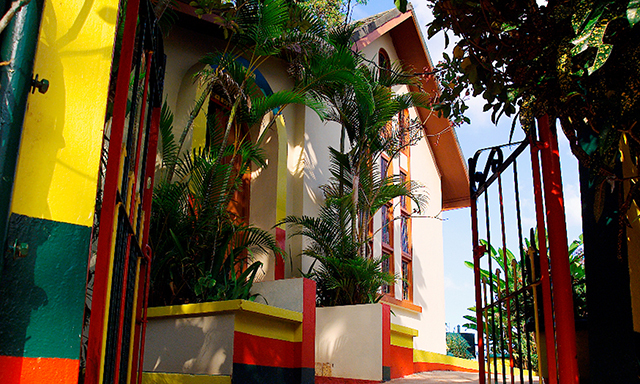 Here, you’ll tour the location of the birth and resting place of the “King of Reggae” Bob Marley. On the return trip, stop at the jerk center for a delicious lunch that includes jerk pork and chicken, rice, and peas. This is a Jamaican experience you won’t want to miss. • Scenic Ride: Listen to reggae as you view Jamaica’s lush landscape in a 2-hour air-conditioned bus ride to Nine Miles. • Jamaica’s “Graceland”: Visit the birth and resting place of the late Bob Marley, and experience the Rastafarian culture and religion. • Authentic Jamaican Lunch: Indulge in jerk pork and chicken, rice, and peas at the local jerk center.